It's a matter of perspective when it comes to Virginia basketball. Is it the first-round loss to UMBC last year? Tony Bennett's teams' lack of a Final Four? What about those two losses to Duke this season? If that's the case, you're going to be pretty down on Virginia. Focusing on what they haven't done is going to make you fixate on what you think they can't do. What about looking at Bennett's 26-3 ACC mark over the last two seasons? How about the defense that continues to be elite while the offense embraces 3-point shooting (at least by Virginia standards) and is, too, among the country's best? 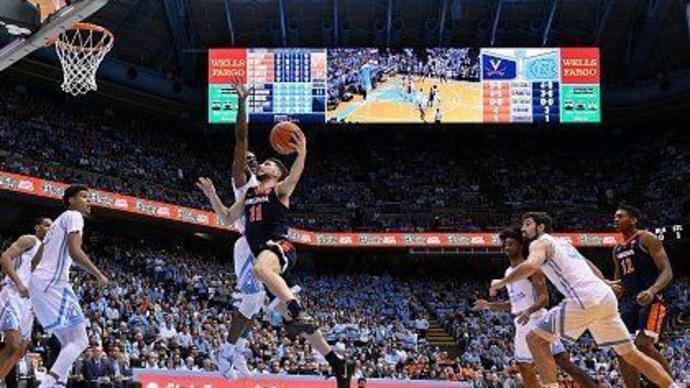 You could look at wins against Wisconsin, Maryland, Florida State, Virginia Tech and now North Carolina, which the Cavaliers topped 69-61 in Chapel Hill on Monday. There's a choice when it comes to evaluating Virginia. Either you care about what they're doing, who they're beating and how they're accomplishing it as they continue to plow through the regular season - or you don't. If you're the latter, here's guessing none of the former matters because at this point, we've seen it from Virginia. They don't get credit for being awesome until they back it up with NCAA tournament success. Which is fine, I suppose, but it's waving away another remarkable season by a powerhouse team. De'Andre Hunter went for 20 points while Kyle Guy matched him and Ty Jerome tallied 15. That's a trio that only Duke can match in terms of talent, and there may not be another team that can make that claim. The plodding-pace Virginia plays at is supposed to be a death knell when the Cavaliers fall behind - but they were down seven with under nine minutes to play and trailed as late as under-five minutes. Didn't matter. Jerome and Guy were great down the stretch, and really those two are the type of killers you want on your side in March. Virginia held North Carolina to 35.4 percent shooting while converting at a 53.3 percent clip themselves. Multiple things can be true at once. Virginia's NCAA tournament track record - relative to seed expectation - is underwhelming. The loss to UMBC was historically embarrassing. The Cavaliers are unequivocally not even the best team in the ACC. Two losses to Duke saw to making that determination. Also, all that has very little - maybe nothing - to do with Virginia's shot at a Final Four and a national championship this year. Here's guessing they won't have to play the only team that's proven can beat them - Duke - until Minneapolis. Winning at North Carolina - while trailing late - would suggest Virginia can beat just about anyone, anywhere. Two losses to Duke are no reason to dismiss Virginia's credentials or potential. Neither is a landmark fluke from nearly a year ago. Just because Virginia hasn't done it yet doesn't mean they can't in the future. Really, all they've accomplished - not what they've failed to - suggests a Final Four and a national championship are very real possibilities. That, at least, is what it looks like to me.